Preheat oven per box instructions. Place paper baking cup liners inside each muffin cup in muffin pans. Mix cake according to box directions. 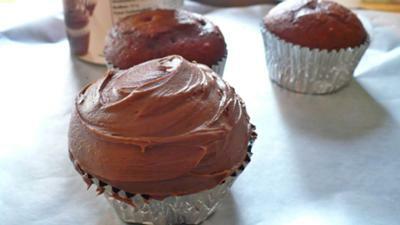 Spoon batter into paper-lined muffin cups. Bake for 18-22 minutes, or until toothpick entered in middle comes out clean. Let cool completely on wire racks. Stir chocolate frosting with a rubber spatula. Frost one cupcake. 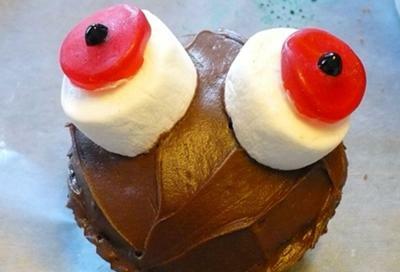 While frosting is still tacky, apply 2 marshmallows about ½ inch apart in center of cupcake. With white decorating frosting, squirt just a little frosting to a gummy Life Saver on the "Life Saver" wording side of the candy. 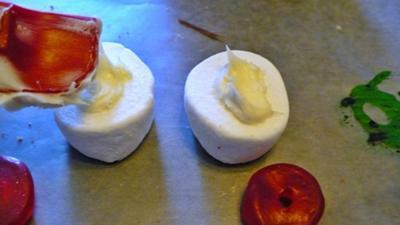 Using the frosting like a glue, adhere the gummy candy to the center of a marshmallow. Repeat with another Life Saver candy of the same color. Then with the black decorating gel, place a dot at the center of each Life Saver candy to create pupils of the eyes. Repeat for each cupcake. Serve when all has dried for at least 30 minutes at room temperature. Careful with wrapping due to the decorating gel not being dried.